Super Baby Laundry Gel is produced by the Ukrainian brand KLYAKSA owned by the pharmaceutical scientific research centre Alliance of Beauty. It is specifically designed to wash baby clothes and bedding made from cotton, linen, synthetic and blended fabric. Can be used to wash newborn clothes. Not suitable for washing wool and silk. 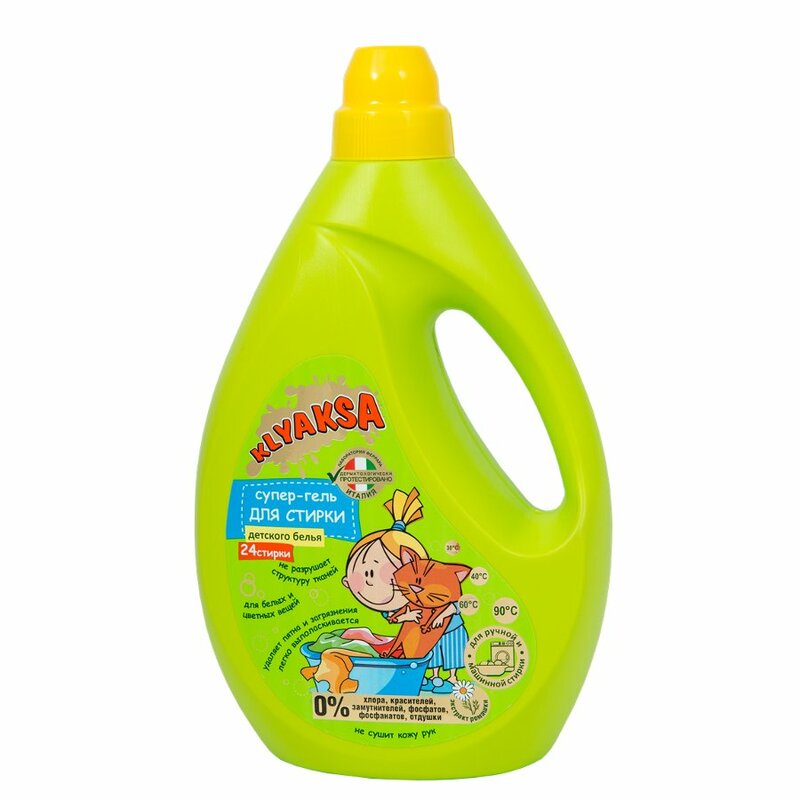 KLYAKSA Baby Laundry Detergent is suitable for both hand and machine wash at different temperatures (30 °C to 90 °C). It dissolves almost instantly and is easily rinsed off during the rinse cycle. The product contains a special colour preserving complex that helps fabric colours to stay bright, that’s why KYALSA laundry detergent is perfect for washing coloured and white things of the whole family. The gel effectively removes all kinds of stains and can be used for pretreatment. Its delicate formula is safe for the fabric and makes the clothes last longer. The laundry gel is infused with chamomile extract. This natural ingredient has a soothing and softening effect. It does not irritate delicate baby skin and prevents allergic reactions. The product is dermatologist-tested at Ferrara Laboratory (Italy). Can be used without gloves. Does not irritate the skin or dry it out. Free of chlorine, phosphates, phosphonates, opacifiers, fragrances and dyes. Directions. Add the required amount of the product during washing. For pretreatment, apply a small amount of the product to the stain and leave for some time. Dosage for hand and machine wash based on the soil level and water hardness: 50*ml for slight soil level and soft water; 80*ml for slight soil level and medium hard water; 110*ml for slight soil level and hard water; 80*ml for normal or heavy soil level and soft water; 100*ml for normal or heavy soil level and medium hard water; 150*ml for normal or heavy soil level and hard water. * One bottle cap contains 40ml. One bottle is enough for 24 wash cycles (slight soil level, soft water). Precautions. Avoid contact with eyes. In case of contact with eyes, rinse immediately with plenty of running water. Consult a doctor if necessary. Keep away from children. Follow the instructions on the clothing label. Ingredients. Water, 15-30% Non-ionic Surfactants, Соmplexing, Vinylpyrrolidone/Vinylimidazol Copolymer, <5% Modified Polycarboxylate, Preservative, 30% Silicone Antifoam, Chamomilla Recutita (Matricaria) Flower Extract, Citric Acid. Want to buy Super Baby Laundry Gel? Call us or submit your order via our web site!